Aleksandr Misurkin and Anton Shkaplerov, both with prior spacewalk experience, will be primarily tasked with the replacement of a high-gain communications antenna electronics box to outfit the system for supporting communications through Russia’s Luch data relay satellites, similar in architecture to the American TDRSS which has been the primary relay asset for ISS communications since the Station began assembly almost two decades ago. The plan for Misurkin and Shkaplerov will be to remove the old electronics unit, install an upgraded box in its place and dispose of the old gear by throwing it overboard. 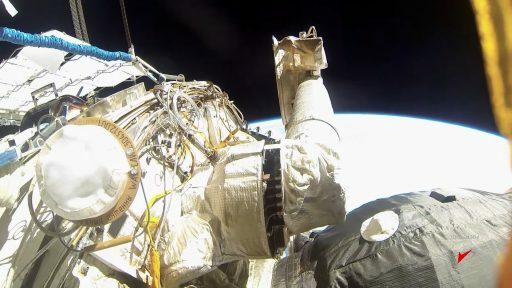 If time permits, Friday’s spacewalk will also feature work on experiments known from previous Russian excursions, Biorisk and Test, and the Cosmonauts could also reposition a foot restraint and collect survey imagery of the exterior of the Russian segment after nearly half a year without EVA activity on the Russian Segment. Friday’s spacewalk will use the Pirs module as airlock, as is typical for Russian EVAs, with a planned EVA start time of 15:35 UTC – marked by the opening of the external hatch. 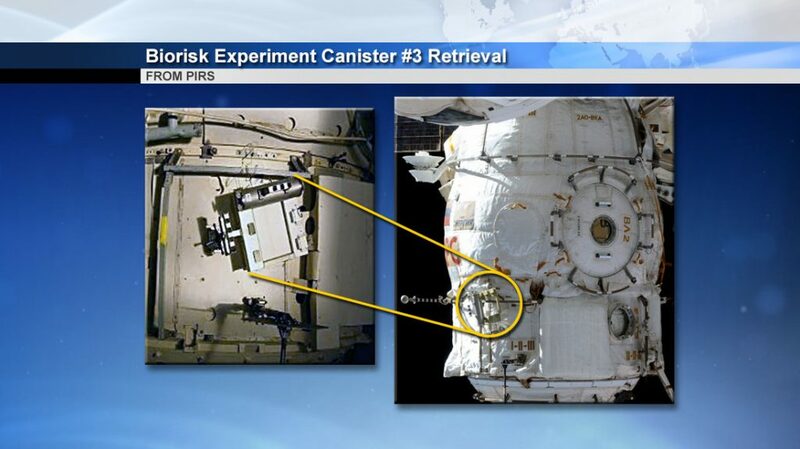 Both of Friday’s spacewalkers have extensive spaceflight and EVA experience. 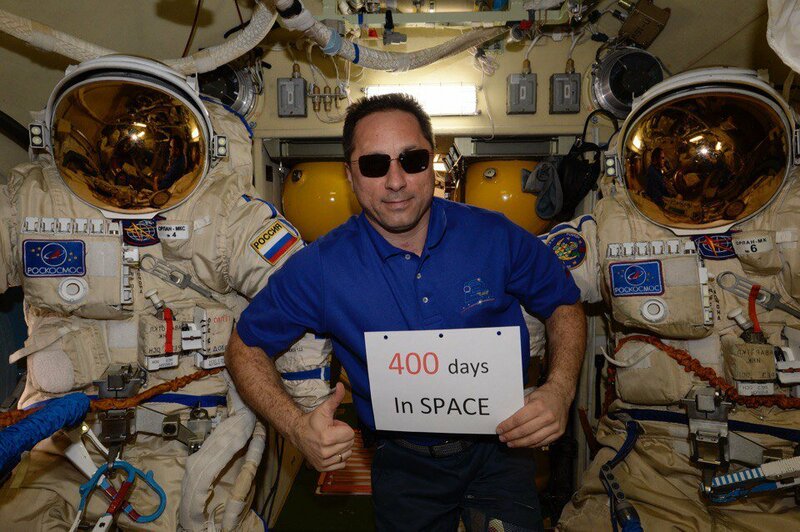 ISS Expedition 54 Commander Aleksandr Misurkin is a veteran of one prior long-duration flight of 166 days in 2013 during which he performed three EVAs with a cumulative duration of 20 hours. His three previous EVA, all performed with Cosmonaut Fyodor Yurchikhin, dealt with a variety of tasks on the Russian segment including wide-ranging cable routing, replacement of a critical cooling fluid regulator and work with different exposure experiments. 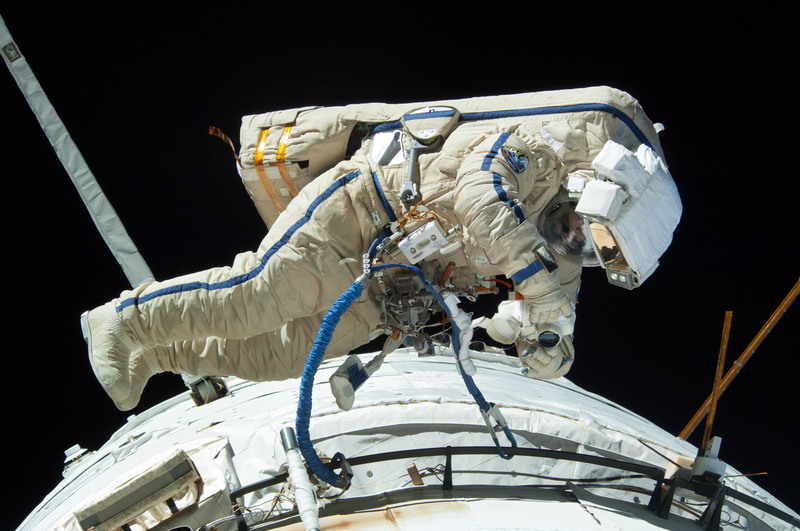 Anton Shkaplerov spent 365 days in space on his two prior ISS missions as part of Expeditions 29/30 and 42/43, but only got to perform one spacewalk to date when he ventured outside with Oleg Kononenko in February 2012 to relocate a hefty cargo boom outside the Russian segment between the Poisk and Pirs Modules. 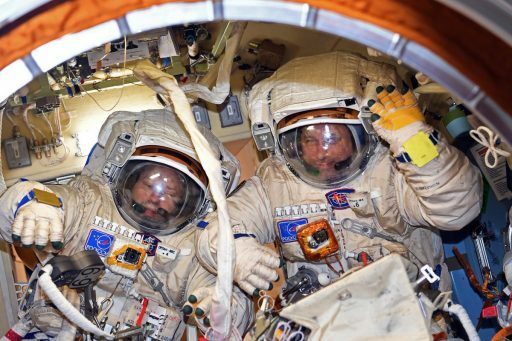 For Friday’s spacewalk – the 44th Russian Stage EVA completed on ISS – Misurkin and Shkaplerov will be wearing different versions of Russia’s Orlan space suit. Anton Shkaplerov will be in Orlan-MK No. 6 while Misurkin will venture outside in Orlan-MKS No. 4 – the first in the upgraded series of Orlans to reach ISS. Orlan-MKS was first tested on the most recent Russian EVA by Fyodor Yurchikhin, introducing a number of upgrades, most notably a suit management computer and a new material used in the suit’s pressurization layer that allowed a backup protection layer to be removed to make the suit lighter and more flexible. 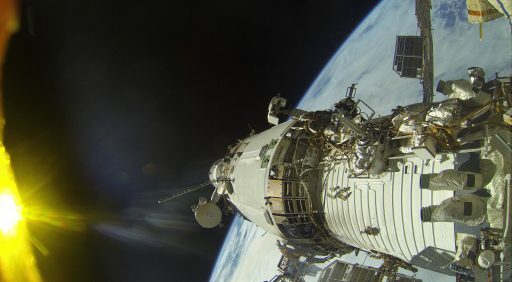 The prime objective of Friday’s EVA will be making the Russian ISS segment fit for communications through Russia’s three-satellite Luch relay constellation. Similar in concept to NASA’s Tracking and Data Relay Satellite System, Luch places at least three satellites into Geostationary Orbit to provide full global coverage of the Station’s ground track to allow near-continuous communications between Mission Control Moscow and the orbiting laboratory through the high-altitude relay stations tasked with routing voice, video and various data streams transmitted in S- and Ku-Band. Luch finds its origins back in the 1970s when development of the first generation of satellites was started under the code name ‘Altair.’ Four Altair satellites were launched between 1985 and 1994 atop Proton rockets and relayed communications from the Mir Space Station, the Soyuz-TM spacecraft and the Buran winged space plane during its first and only flight in 1988. The first generation of satellites was to be replaced by upgraded craft, known as ‘Gelios,’ but only one such satellite was launched in 1995 while a second flight unit was destroyed in a fire and never replaced. However, Mir was only able to enjoy global Luch coverage for a brief period. In the initial stages of the program, Luch suffered a number of problems including short satellite lifetimes and the result was a coverage that left much to be desired, according to accounts from the time. 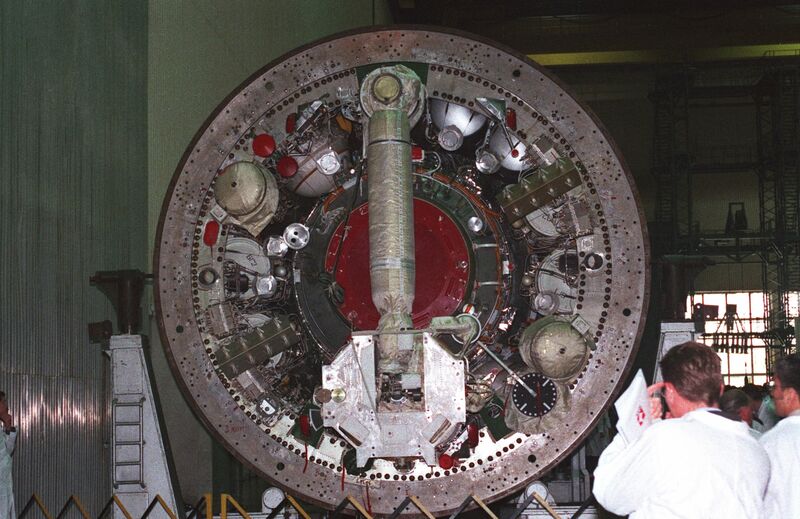 With the 1995 launch of Luch-2 No.1, Mir, for the first time, had reliable round-the-clock coverage, but the newly gained luxury only lasted a year until the Altair N. 3 satellite failed in early 1997. By that time, Mir was believed to be well on its way toward retirement and the new International Space Station was to use the American TDRSS system – allowing the Luch program to lapse, at least for the time being. Without Luch, crews on Mir, with its life extended into 2000, had to revert to the old ways of only communicating when over Russian Ground Stations. When ISS was deployed, the Russian Zvezda Service Module was fitted with a high-gain antenna compatible with the Luch-2 satellite generation as plans were to return the system to operational strength shortly after ISS began permanent crewed operations. However, funding problems were one of the major issues the Russian space program faced through the 1990s and 2000s – delaying a number of satellite programs, including Luch. With no replacement for Luch, the “Lira” communications equipment outside Zvezda sat idle without functional use. The Russian Space Agency signed a contract with ISS Reshetnev in 2009 for the development of the next-generation Luch System that was to take on a broader role of supporting the International Space Station, relaying data from Soyuz, supporting remote sensing missions in lower orbits and returning telemetry from ascending launch vehicles. This meant the next-generation satellites would use vastly updated communications equipment no-longer compatible with the antiquated 1990s electronics installed on the Zvezda module. 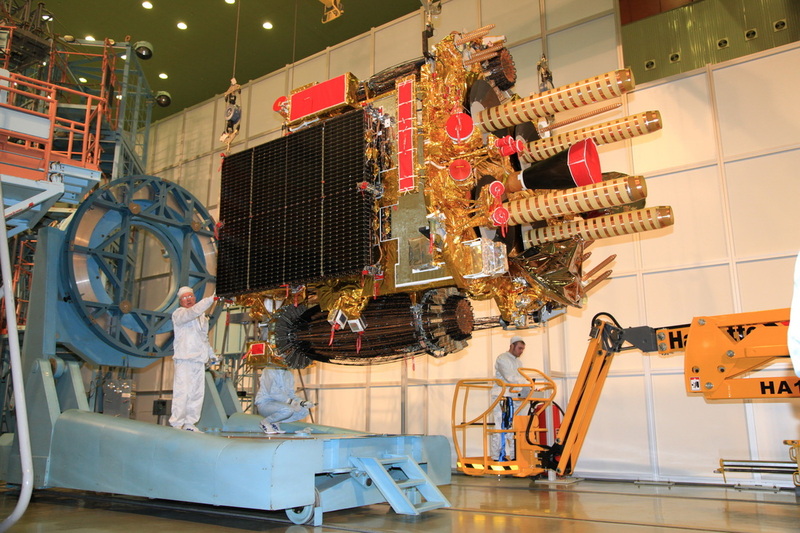 The three-satellite Luch constellation began deployment in December 2011 when the Luch-5A satellite lifted off atop a Proton rocket. Luch-5B followed in November 2012 and the third member, needed to close a gap left between the first two geostationary satellites, headed into orbit in April 2014. Since then, Luch started regular service and, with the inauguration of the upgraded Soyuz MS spacecraft, has begun supporting Russia’s crewed space program. 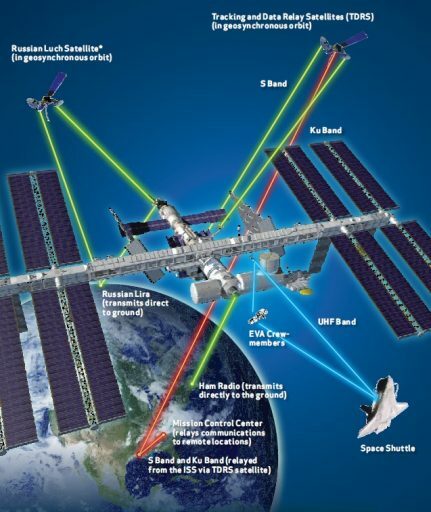 However, given the old-fashioned equipment on Zvezda, the Russian ISS Segment could not yet enjoy round-the-clock communications through Luch and continues to rely on the U.S. TDRSS and Russia’s ground station network. One major problem to be faced by Misurkin and Shkaplerov on Friday will be the fact that the Lira electronics assembly was not built for servicing or replacement in orbit. 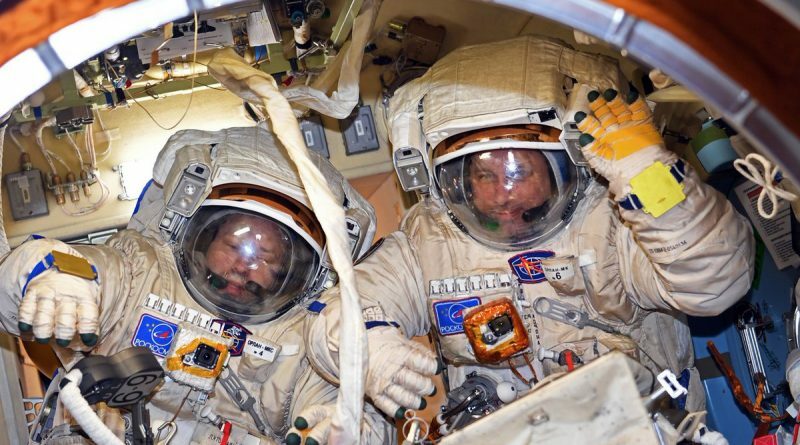 To that end, the electronics unit is in a position that will be difficult to gain access to and its disassembly will require Misurkin and Shkaplerov to release a large number of small bolts and electrical connectors that were not built for manipulation by crew members in space suits. The two spacewalkers will be armed with three purpose-built tools that are hoped will enable them to deal with stubborn bolts in order to release the old electronics unit. They will then be tasked with installing the new & improved communications gear and connect its data and power circuitry to the Lira system. Per typical procedures, the crew would then hold off until the ground can power-up and check the new system before disposing of the old box in Russian EVA fashion: sending it away from ISS with a gentle push in the aft/nadir direction to avoid re-contact on future orbits. The old gear will eventually succumb to drag and re-enter the atmosphere. Given the expected fluidity of the EVA timeline, the only primary task identified for Friday’s excursion is the Lira communications unit replacement. Provided there is time left in the planned 6:40 spacewalk, the Cosmonauts could be tasked with dismantling the Obstanovka fields & waves instrumentation, retrieving several Test Exposure Units and/or collecting a Biorisk Exposure Container supporting a space-biology study by subjecting bacteria, fungi, plant seeds and dormant organisms to the space environment outside ISS.